Babies can begin to teethe as early as just a few months old, but it might take a while before the actual tooth even appears. Some babies never show any signs of teething apart from drooling and chewing on everything while others will get fussy and cranky as the tooth is popping through. Some babies will sleep through it all while others will have numerous night wakings. Some experts have said it will not disrupt sleep, but I wholeheartedly disagree. As with everything else, all babies are different and they will all have different pain tolerances. I know that my son did seem to be affected and since none of us can go back and know what it feels like, I believe it’s our job, as parents, to be sympathetic, while also making sure they get enough sleep. If baby is extra fussy during the day when he’s awake (i.e. he is not fussy because he is sleepy), make sure you make him extra comfortable at bedtime with a dose of Motrin or Tylenol or teething tablets and cold washcloth to numb the gums (Please note that Orajel has now been discouraged for babies under two years old by the FDA). Note: My pediatrician did not OK Motrin until 6 months old. I prefer Motrin because it lasts longer (6 hours) than Tylenol (4 hours), but you should check with your pediatrician about when you can administer it to your baby. “Teethers” can be another great (and medicine-free) way to alleviate the pain of teething. We recommend The Nuby Teether, Baby Banana Teething Toothbrush, and the Zo-Li Gummy Stick to our clients. Given a baby teethes for what feels like a constant 2 years, you should figure out a plan for how you will handle it because you can’t allow too much sleep deprivation in the name of “teething”, since you may think something is a teething problem, but it’s really a sleep problem. My plan with my first son was that if he was extra fussy during the day, I’d give him Motrin (and Orajel which is now a no-no) at bedtime. If he had any night wakings 6+ hours (give or take 1 hour) after the medication, I’d tend to him with another dose and then stay with him for 30 minutes until it kicked in and then put him back down. It was usually only about 2-4 days of super fussy times that he needed extra soothing until the tooth popped through. Other times, I’d have to be more stringent on my nighttime visits, because of the problems it would create. If you are nursing, expect baby to possibly nurse more frequently as it feels good on their gums. As always, you may have to set limits and be careful not to create a sleep association with nursing to sleep. 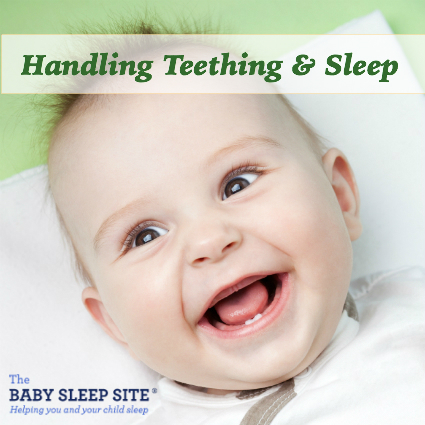 Should You Stop Sleep Training During Teething? In general, my answer will be no. If you waited for all your baby’s teeth to pop through before you sleep train, you might wait over 2 years! Some baby’s teeth pop through at a few months old but others don’t until past a year old! Since you have no way of knowing, you need to just do your best and make sure you prioritize your baby’s sleep. Having said that, you may need to alter your plan a bit, as I suggested above, during the few days the teeth are about to erupt through the gums (you might notice them right on the surface of the gums and your baby is extra fussy), but otherwise, help them feel comfortable, but continue to be consistent and help them learn to sleep better. Do you have any teething tips? Question about baby teething and sleep? Scroll down to ask – we’ll answer – to share tips, and to hear from parents like you! Disclosure: The Baby Sleep Site® is a participant in the Amazon Services LLC Associates Program and other product affiliate programs. If you click on a product link above and make a purchase, The Baby Sleep Site may receive a small commission from the company selling the product. This commission will not affect your purchase price. We only recommend products that we believe are quality products and good for our readers. My 8 month old is getting her second tooth and has been waking 3x in middle of night for about a week now. She wakes up crying/groaning for a few minutes then puts herself back to sleep. Is it ok to give her tylenol every night? Hello @April – Than you for writing to us! I am sorry that your little one is struggling through teething discomfort! We understand how tough that can be! Before administering Tylenol, please check in with your baby’s doctor. They can best advise you on how to help and what to give to her and when. My lo is 4months old now and before two weeks i finally moved him to his room but sleep has been a nightmare. Even though he falls asleep really easy at bedtime he only stays asleep until 1am and after that he wakes every hour crying. I know he is teething but he doesn’t seem that much in pain. I tried using Tylenol but it didn’t work. Im going mad. Any tips? My baby will be seven months on Friday. Up until two weeks ago he slept pretty well only getting up once around 4 AM to breast-feed. In the past two weeks he has gotten up multiple, multiple times per night screaming sometimes for minutes, sometimes for hours. Any suggestions? Thank you for visiting The Baby Sleep Site! I’m sorry to hear you’re dealing with these tough night wakings 🙁 When something like this comes on suddenly, we always recommend checking in with a pediatrician first thing, because it could be something like an ear infection or another medical issue that needs treatment. A pediatrician can also give you some advice on whether pain killers at bedtime would be a good fit for you, if your son is teething. One of my twin girls is getting all 4 of her molars and we are on a full week of waking up in the middle of the night. She had always been an easy sleeper and STTN so I only imagine it’s her teeth. Some nights are easy to get her back to sleep, others it’s taken 2-3 hours. How long does it normally take for molar pain to be over? Hi @Danielle – Thank you for writing and I am sorry that your daughter’s teeth are causing sleep disruptions! As you can imagine, the molars may take longer than the other teeth to emerge. since they have a larger surface area that needs to break free from the gums. Every toddler is different and responds differently to teething, but if you are concerned, or if this continues over another week, do check in with her doctor, to rule out any troubles with the teeth or other reasons for her waking. Hi there. My poor baby is only but struggling with her teething, her first bottom two came out about 2 months ago, although the process started at 3 months. She wasn’t nearly as fussy and moody as she is now, then it lasted about 3 days and now with the top two it feels like it’s been forever. What I’m most concerned about is that she has hectic diahoria in which she poops atleast once every hour sometimes 3 times in an hour. Shes not really interested in eating but she does drink a bottle of milk every now and then. Do you have any advice at all? Any remedies that can help her sleep better as well? @Kylie – Thank you for reading and for sharing. Such awful diarrhea sounds terrible! If you haven’t checked in with her healthcare provider about it to make sure hydration and nutrition is covered with such frequent bowel movements, we’d encourage you to do so. Increase in bowel movements or looser stools could definitely be caused by the teething. If your daughter’s healthcare provider okays and you haven’t considered Motrin or Tylenol to help with the pain or some form of teether, those would be a great first place to start. My LOs never much cared for teethers but the Motrin was a lifesaver for us! Hang in there, Kylie! I hope this helps, hang in there!